Musician, singer-songwriter and conductor Eddie Vartan ( 1937-2001) is the brother of French pop star Sylvie Vartan, father of actor Michael Vartan and uncle of David Hallyday. As a bandleader he was the mastermind behind his sister´s early success. He also composed many songs for her and a dozen titles for his friend and brother-in-law Johnny Hallyday. Eddie, Sylvie and Johnny were certainly at the top of the yé-yé game. They sold a ton of records and the teen magazines were full of their antics. In the early 60s you couln´t be cooler than these three. Surprisingly though, when I searched for “Eddie Vartan” on Amazon/Itunes/Spotify only one song popped up. Considering the celebrity status of Eddie Vartan and his family, it´s a real shame that his whole solo instrumental works of the 1960s, especially the early twists, have never been reissued in 50 years. If it wasn´t for a handful of people who put his music on Youtube, it could not be heard at all. The two instrumental twist songs from other EPs on the Twist label, the mid-tempo Salut les copines and the hectic S.L.C.Twist, are both similar in style to the tracks I present here. Then there is his version of Telstar in a weird Scopitone film that you´ve got to see to believe. Eddie himself even appears playing the guitar while following a female astronaut, surrounded by his band all dressed in lab coats like a bunch of Joe Meeks. All these songs would sure make a nice Eddie Vartan Twists compilation LP. Eddie Vartan died in 2001 following a brain hemorrhage in Paris at the age of 64. Shortly after Sylvie Vartan recorded Réponds moi, a wonderful tribute to her brother. Again, it was a fan who made an effort to put the song together with some collected images of Sylvie, Eddie and Johnny. 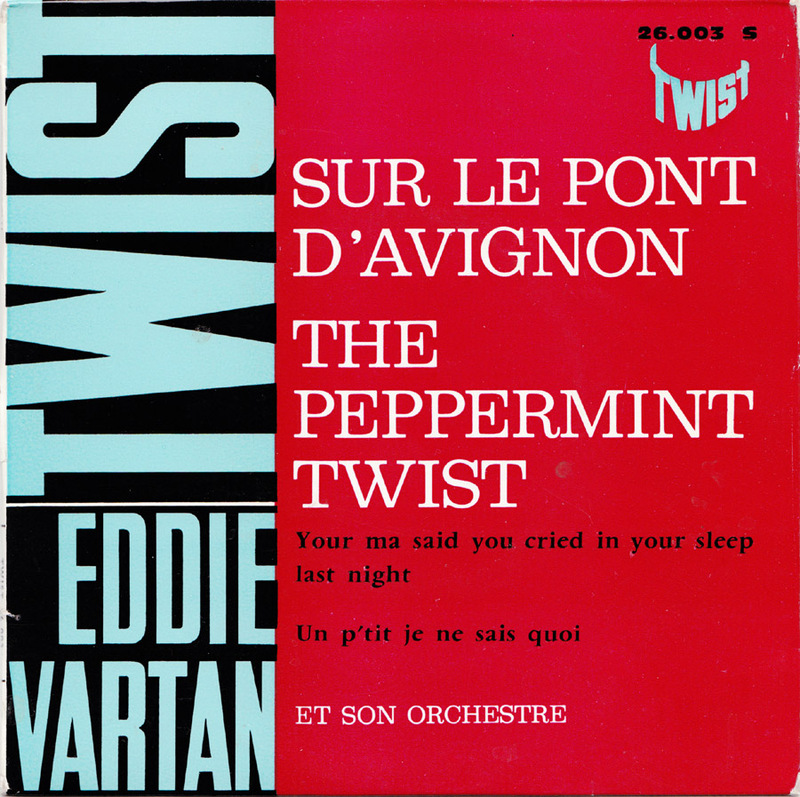 At least seven EPs by Eddie Vartan were released by the small Twist label, that was distributed by Decca. A bunch of other artists also recorded for the Twist label, but not as many as Eddie Vartan. Of all the Twist label releases, this one has by far the most boring sleeve design. It´s probably because I´m a cartoonist that I feel that all-typo designs look dull. 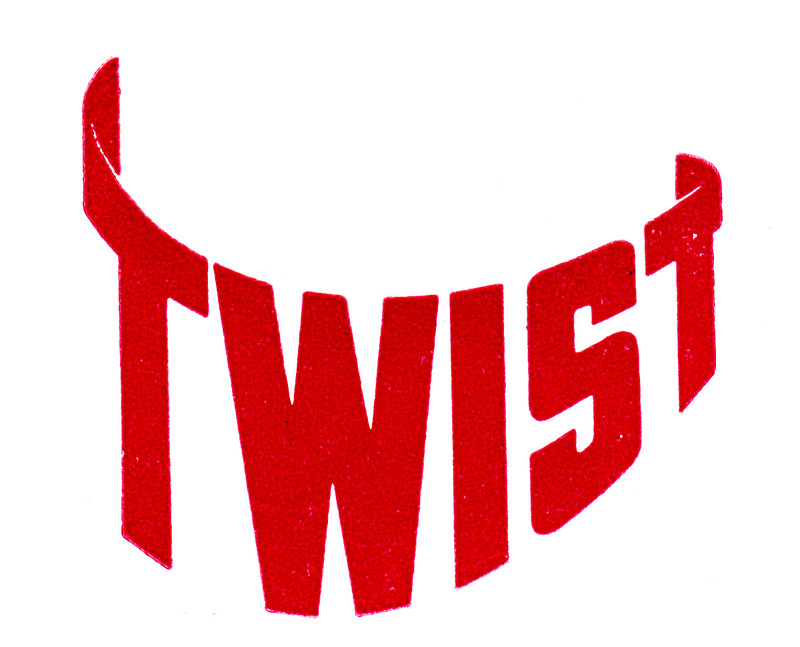 The hand-made Twist logo is cool though. This EP was very cheap, but unfortunately when I got home I discovered that my copy was sun damaged and warped at the sides. Two of the tracks are completely unplayable. One Track Mind was recorded by Bobby Lewis in 1961 on the Beltone label. Eddie Vartan´s instrumental version copies the Sheb Wooley-style sound of a toy saxophone that is also in the Bobby Lewis original. some weight on it and place in the sun for a while. experiment first with some bad ones of no value. Or a oven can do???? temp,time? ?